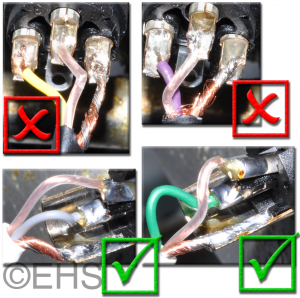 Event Horizon & Services - Is hiring a professional for my wiring worth it? It is safe to say that we build a lot of new cables. 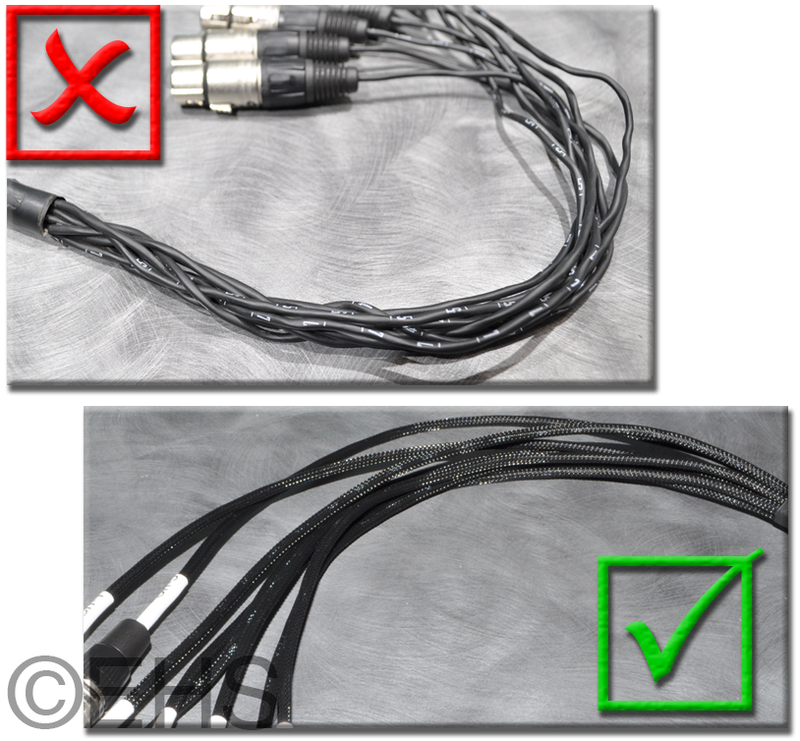 But sometimes a customer already has a cable, and they want it modified. 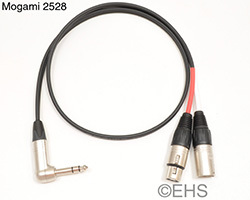 In this case, it is an eight pair snake with XLR connectors, and it needs TRS 1/4″ connectors on one end. It is for a church, and they are upgrading the console and do not wish to purchase all new cables. No problem, we are happy to modify or rebuild a cable. All they know is that it is a Mogami snake. I thought that meant it was an off-the-shelf Mogami constructed snake. It is not; it was certainly built by an amateur. I don’t know who, whether it was a volunteer, or a member, or someone working cheap or a lazy professional, but let me get into what I found. 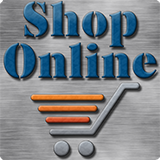 So first there is no doubt that we love Mogami cable. It is all top quality stuff, but the snake cable has an issue. Once you strip back the main jacket of the snake, you are left with the channel wires. These wires are very flexible and very lightly jacketed. You certainly can put connectors on at this point and call it a day, but you are left with a snake that will tie itself in a knot if just you look at it funny and the channels are NOT very durable. When we build a snake, we use braided sleeving (some call it tech flex) on all the channels. It serves several functions. First, it stiffens the channels a bit so they don’t tangle as easily, it allows the wires to slide past each other so you can untangle when needed, and most of all it’s an extra layer that protects the channels from damage. Under equal conditions, a sleeved snake will last years longer than an un-sleeved snake. Here are some photos showing the un-sleeved snake and the improved sleeved snake. The next thing is the snake to fanout transition. This one just had electrical tape wrapped around it and for anyone that has ever taped anything you know after a while that tape will either dry out or get gummy. This tape has gotten gummy and nasty and every time you handled the snake a bit of that nasty sticky rubbed off on your hands. We secure that transition with tape so that it cannot be pulled apart, or a channel cannot be pulled out and mess up the spiral structure of the snake, then we use shrink tubing over for longevity. While we are talking about this transition, the builder also cut into the channel wires’ jackets while cutting off the outer jacket. This can allow air and moisture into the channel and can compromise the ground wire, but worse yet without any other reinforcements or safe guards, it could allow the jacket to completely tear and leave the snake complete trash. I know all that sounds bad, but it gets worse. Once we cracked open the connectors, we found the most atrocious thing (in the wiring world): bad soldering. These connectors look like someone soldered them that has never soldered before. Seriously, my eight-year-old solders better than this. 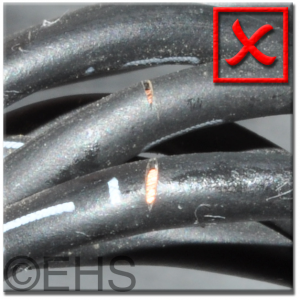 The wires do not look like they had been tinned, which leaves a high likelihood for cold solder joints (failed connections). Some wires were barely attached. I am amazed this snake was still working. The last point brings us to labels. 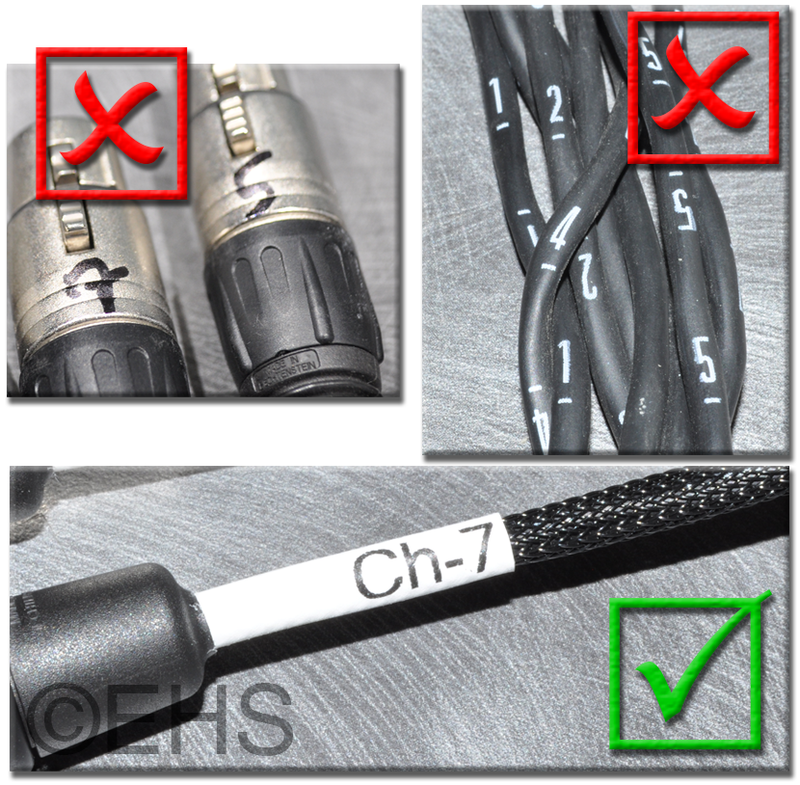 The Mogami snake cable has number labels on the channels, but they are hard to read. Someone had taken a sharpie and numbered the XLR connectors. That isn’t so bad, but if you are going to do it, do it right. 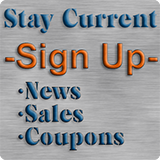 We add a shrink label with the number printed on it, and it is easy to read in about any light. Plus the addition of the shrink label gives two benefits. First, we have ten colors so you can color code your snakes to help in identification. Second, and I think more importantly, the shrink adds additional strain relief to the channel and will increase the lifespan of your snake. Yes, cables are expensive and really not the most exciting thing to spend money on, not a lot of wow factor, I know. But let me ask- if you are sitting in a session, or the audience is starting to gather, do you what to bet your show or your reputation on the unpaid intern’s or the volunteer’s soldering and construction skills? Often much of the cost of the snake is the parts, so for the sake of that investment you should make sure they are solidly and smartly built too. On top of that, with bad construction you could find yourself having to completely replace your snakes because they died prematurely. 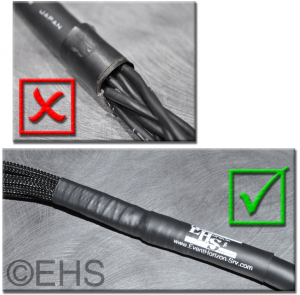 When we build our snakes (all our cables, for that matter) it is about quality across the board; we want that cable to last as long as possible so we sleeve it, add shrink and wrap, shrink the fanout transition, and we certainly solder great. We see what the other companies build; some are cheaper, some are more expensive, but our snakes are always better. Quality for us is not some just marketing/sales lingo and it’s no secret – you can put your finger on it, we can photograph it, and darn it, we like to brag about it.